I forgot what it felt like to bake a bread: just because! I mean, I bake focaccia quite often and of course, I bake for my #TwelveLoaves baking group once a month. But it seems somewhere along the line, I forgot to bake an occasional “just because” bread. I have to say I felt inspired by one of my friends I found through my blog. Arlee will sometimes tweet a photo to me of something she’s baked of mine. I’m a huge fan of Arlee and all she does. She’s so creative and has most fun lunch ideas for her gorgeous kids! Now that we found each other on Instagram, I will also get a tag from her to show me what’s baking. It just makes my day…seriously. Thank you, Arlee!! 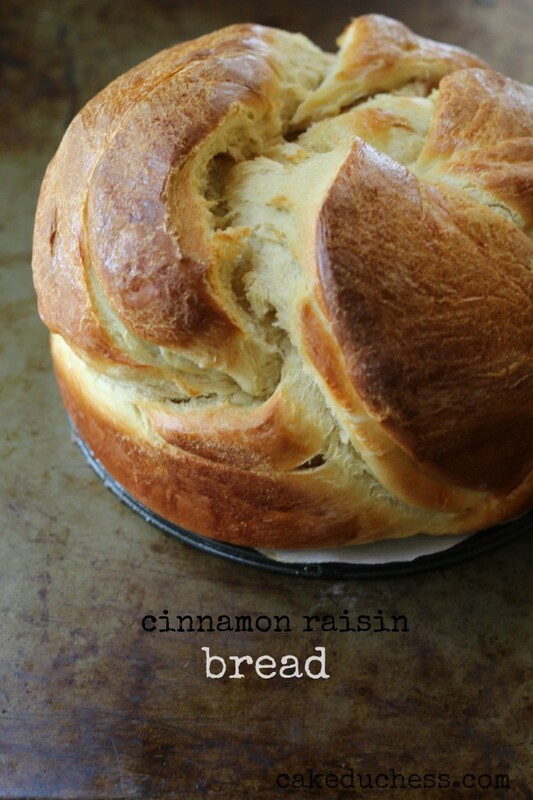 So…Arlee was up to some baking again and this time she was baking a cinnamon raisin challah. I made this one a while back. I thought it was time to try to change the recipe a little…maybe the shape? 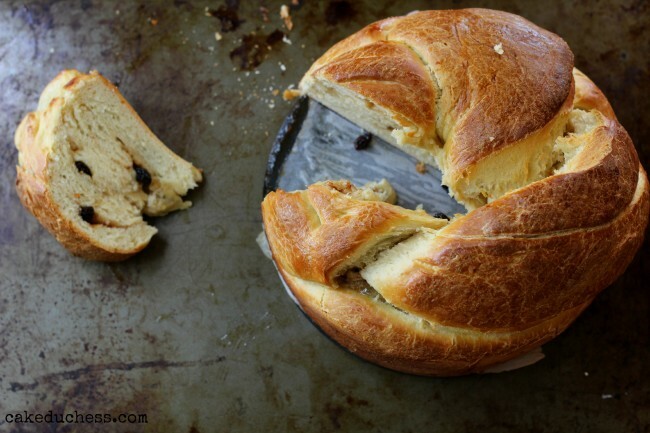 I had the thought of braiding the bread and then twisting it into a round shape. 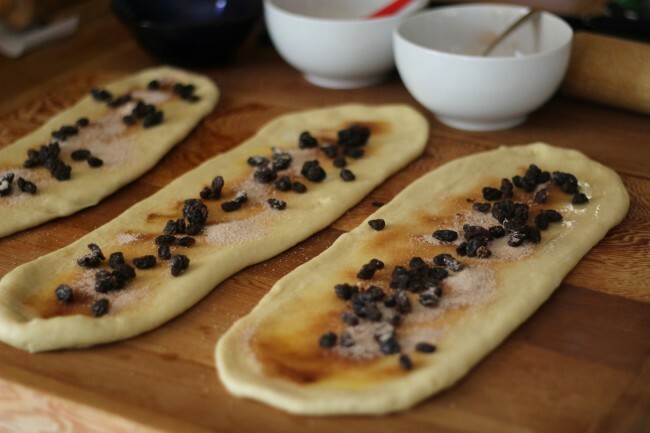 Each strand is filled with some fantastic goodness: cinnamon sugar and plenty of raisins…oh, yes! Can I tell you? There is nothing like freshly baked bread! I may have left my dough to proof a bit long. 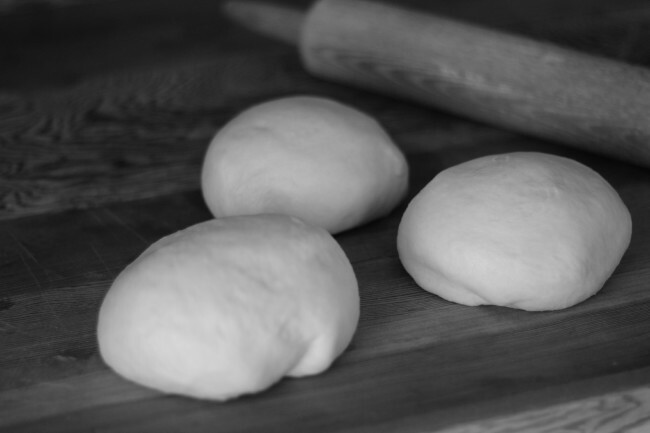 But, no fear…this dough was so easy to work with! I pinched the sides and ends of the ropes together. There were some that were sneaking open and some butter making its way out. I persevered! There was no way I would give up on this bread. You dedicate so many hours to making it with the high hopes of soon having the most heavenly smell come out of the oven. I thought it best to carefully lift it into a 9-inch spring form pan (I did spray it with baking spray). 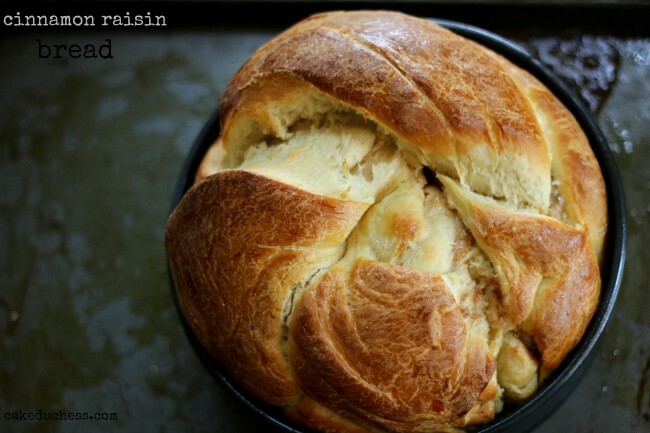 The bread was braided on top of parchment paper. I ripped the paper around the sides and left it only right underneath the form of the bread (a circle of parchment paper with a little overhang for me to carefully lift). I didn’t have to let it rise too long. It rose again for about 15 minutes. I knew it was ready to go in the oven and that it would rise beautifully…and boy, did it ever! I baked this bread as one round bread. I wasn’t sure how my dough was going because I let it rise too long. But this dough is really enough to do 2 breads. So use 2 round spring form pans (or a 9 inch cake pan). I lowered the temperature after 30 minutes because it wasn’t quite done in the middle. I kept on baking for about another 30 minutes on 325. Check your bread because you don’t want it to get too brown. If you aren’t as daring as me and want to try to braid and then twist into a round shape, keep it as a braid. The braid will bake faster…you could see my post on the braid here. Suggestions for any leftover: French toast! Yes, this makes killer French toast!! Trust me, it’s worth making it to just have the French toast! 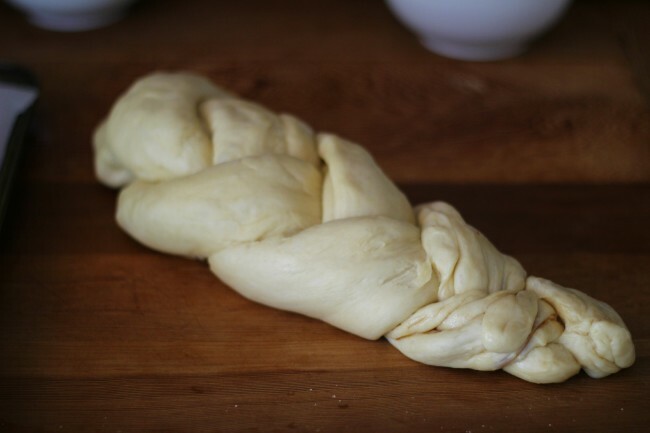 Tomorrow we have a dinner with friends for their Jewish holiday so I will be making a regular challah braid to bring to them. I know they will be thrilled to receive it…and I can practice my braiding a little more!! To my friends that celebrate, Happy Rosh Hashanah!! 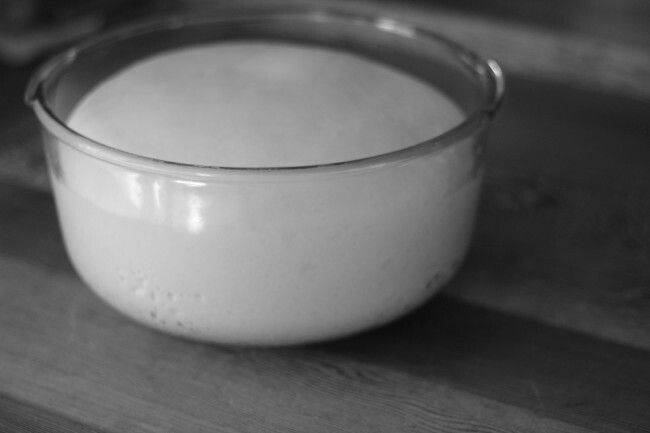 a mixer, with a dough hook attachment, add the warm water and yeast. 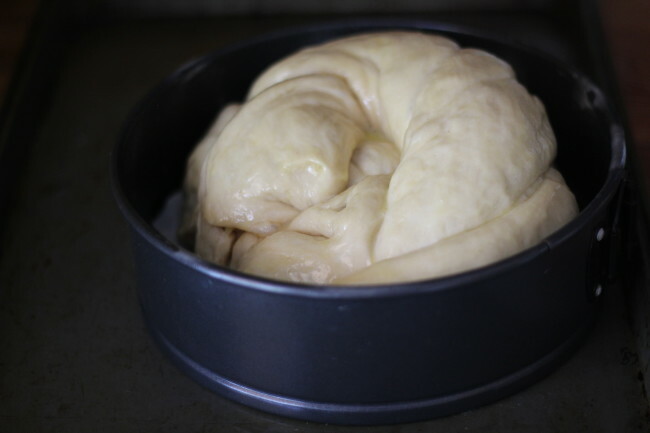 a spring form pan that has been sprayed with baking spray. resting, preheat oven to 350 F.
making one large loaf, bake the challah for 30 minutes (on 350 F). still could lower the heat after the first 30 minutes.